Four athletes in Wood Buffalo seized upon a dream to make the impossible possible, to run the legendary Fort Chipewyan winter road in the deep dark days of winter, a punishing distance of 280 kilometres over pitched hills, around blind curves, across frozen rivers and over the wide expanse of the delta of Lake Athabasca. By air, the distance is considerable, on foot, almost unimaginable. 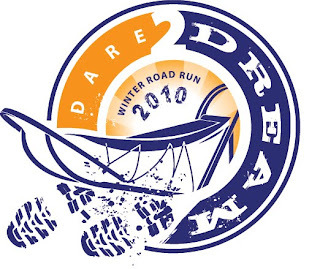 The project became known as Dare2Dream: Winter Road Run 2010. Owing to unseasonable and unparalleled warm weather at the tail end of February and into the first week of March, the winter road was closed today, forcing the runners and the project team to make some hard decisions. After a lot of discussion and reflection, it was decided to reschedule the run for January 2011, at a time when the the road is almost guaranteed to be open. As the new communications director for the project, coming onto the team in the last week, I can't even begin to imagine the emotional impact of this circumstance. The runners have been training for over six months, giving up valuable family and personal time, putting their respective bodies through hell to prepare for the five day trek from Fort McMurray to Fort Chipewyan tethered to a dogsled. They visioned. They pushed through the pain. They dared to dream. In rescheduling to the next year, the runners and their support team have in fact reinforced and reignited their belief in the dream and their commitment to make the impossible possible. Had things gone according to plan, a week from now they would have been soaking their toes in the hot tub secure in the knowledge that their work was done. Instead, they have dug deep and signed on for an additional year of mentally and physically preparing for another attempt. Their courage and commitment is beyond question and inspiring to us all.